All versions of Microsoft Outlook and the Outlook Web App (Outlook.com, Office365), offers the Junk email filter, that helps you to control the unsolicited and malicious messages, by letting you decide which messages or recipients are unwanted. By default and to help the user, the Junk email filter is turned on and moves automatically all the messages that it considers as Junk or Spam to the Junk Email folder. The Junk email filtering, which is offered in Outlook Web App (Outlook.com, Hotmail, Office365), is a very useful feature to protect you from the unsolicited emails, but sometimes the filtering doesn't work reliably, because it marks – and moves to the "Junk Mail" folder, emails that are legitimate. This results to missing emails, especially if the Outlook.com (formerly "Hotmail.com") account is configured as a POP3, in an e-mail client program or on a mobile device. This tutorial contains instructions to completely disable the Junk Email filter in Outlook Mail (Outlook.com, Hotmail.com, Office365). 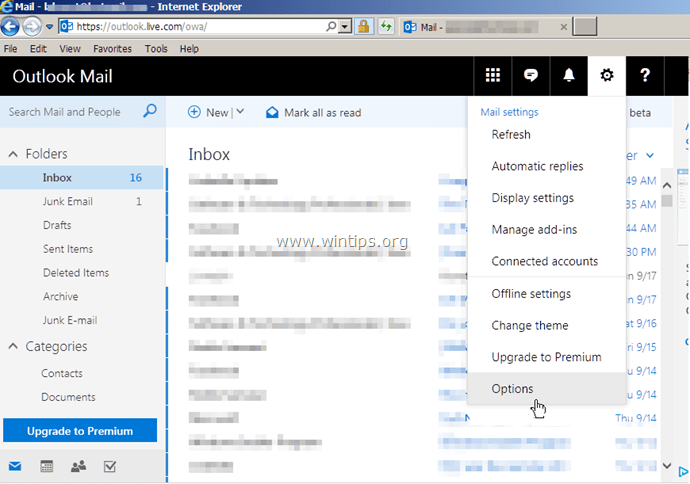 How to Turn Off Junk Email Filter in Outlook Mail or Office365 Mail (Outlook Web App). * If you 're using Office365 click here. 1. Click the gear icon on the top right corner and then choose Options. 2. Select Inbox and sweep rules on the left pane. 3. Click at plus icon to create a new rule. 5. Then type your email address (e.g. "youremail@domain.com") in the empty box and press Enter. Then hit OK to save changes. 7. Choose the Inbox folder and click OK.
* If the above "trick" is not working for you, then the only way to solve your problems, is to manually mark the legitimate emails at the "Junk E-Mail" folder, as "Not Junk". To perform this task, navigate to the "Junk-Email" folder, select the trusted email, and from click "Not Junk" at the Outlook Mail menu. – Additionally, you can manually add the trusted senders addresses at "Safe Senders" at "Junk email" options. 1. Click the gear icon on the top right corner and then click Mail under "Your Apps Settings" section. 2. At the left pane expand Accounts and select Block or Allow. WARNING: If you select this option, mail detected as spam by Exchange Online Protection will be delivered to your Inbox. Apply this rule only if you 're missing legitimate mails.